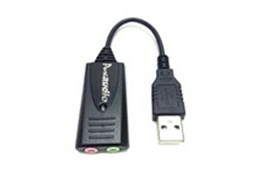 A high-quality USB Sound Card that supports both stereo microphone input and stereo speaker output. Increase intelligibility and performance of microphone input and stereo speaker output with patented noise reduction technology enhancing your digital audio applications. Your headset, microphone or speakers will perform only as good as the sound card or integrated audio system that you plug into. Most laptops and PCs today have audio systems built in and it is often placed close to noisy components like the power supply or high frequency processors. In addition, PC's may be used in high noise level environments which can affect the performance of applications, such as those that use speech input. 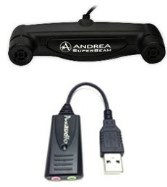 Andrea's PureAudio™ USB-SA with patented noise reduction technology eliminates noise problems as it utilizes high quality digital circuitry and has state of the art noise reduction algorithm software. This format bypasses your desktop or laptop computer's sound system, providing increased intelligibility and performance of stereo microphone input and stereo speaker output for all of your digital audio applications including VoIP and speech recognition programs. Hi-fidelity external sound card with CD quality digital sample rates. Converts the built-in sound of the average desktop or laptop into a rich audio experience designed for PC users who insist on high quality/low noise audio. Upon receiving our new PureAudio USB-SA (the USB external soundcard), we were immediately impressed by its compact size (not much larger than a thumb drive) and CD quality sound. The full duplex PureAudio USB-SA isn't just a petite pretty face. The USB-SA produced the lowest noise floor of any previous soundcard we've tested which includes the entire line of Sound Blaster cards, VXI and other Andrea Electronics USB soundcards. It even nudged out our latest favorite, the Buddy 6G. We found the blue LED light to be quite innovative because it lets you know whether or not the USB pod is drawing current from the USB port by remaining lit and when you turn on your microphone, the blue light blinks to verify the USB-SA is receiving a signal from the microphone. The USB-SA seems to be well thought out and attractively priced at $45 which is lower than any other full duplex USB Pod we've come across. Some of the microphones that we sell have difficulty with full duplex USB Pods but none have a problem with the USB-SA which is now our favorite.